Going west at long last! It seems that there are fewer art pieces to be spotted along the roads as you travel westwards. 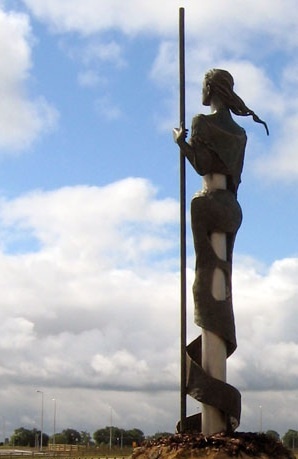 ‘Moategranoge’, a four metre bronze and stainless steel figure of the local Brehon princess, Gráinne Óg, stood majestically on a motte off the M6 going from Kilbeggan into Moate, Co. Westmeath in 2008. It was from this historical spot that Gráinne adjucated on causes and delivered her oral laws to the people of Ireland. The cuts in her clothing were evocative of the esker landscape on which Moate was founded. This spectacular and symbolic sculpture by Ann Meldon Hugh was stolen in March 2011 for its metal but fortunatedly was recommissioned by Westmeath County Council to be re-erected this year in the Midlands Amenity Park in Moate. 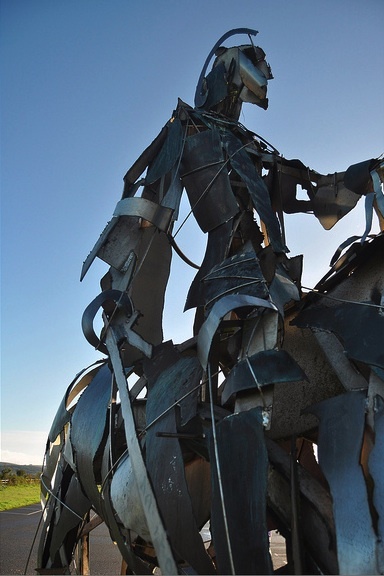 The Gaelic Chieftain is a most iconic and impressive art piece by Maurice Harron. The piece is a 4.5 metres stainless steel and bronze sculpture that overlooks the site of the Battle of Curlew Pass fought in 1599, when a rebel Irish force led by Hugh Roe O’Donnell defeated an English army during the Nine Years’ War. The majestic statue representing the Gaelic chieftain Hugh O’Donnell is located on the N4 outside Boyle in County Roscommon. It stands on the highest part of the Curlew Mounains and is surrounded by Lough Key. The sculptured metal horseman was unveiled in 1999 to commemorate the Irish victory 400 years later. The Curlew Hills caught Maurice Harron’s attention and inspired him to create this magnificent art piece for this particular setting. In an interview a few years after creating the work, Maurice Harron noted that “when [he] put a work up in a certain area, [he] has a responsibility. This thing has to exist in the context of its own location.” The sharp angular metal pieces that make up the sculpture seem to me to symbolise the violence on the battlefield as well as the weaponry and armour carried and worn by the soldiers. For me when I look at this I can almost hear the clanging of metal sounds of battle, making it tremendously poignant. 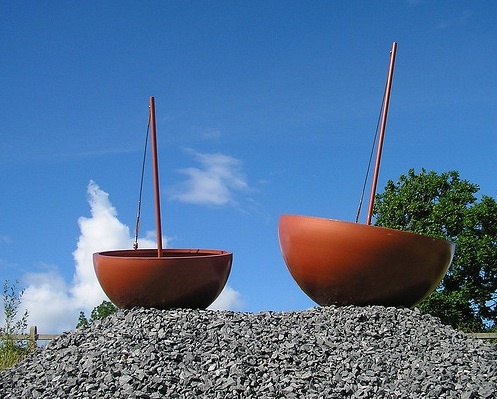 ‘Coracles’ (2005) by artist Irene Benner is inspired by the small lightweight boat used by fishermen on Irish waterways. Coracles were made of willow rod, animal skin and a thin waterproof tar outer layer. A little like the more familiar currach only that the oval shaped coracle was smaller and tailored to the river conditions. Coracles are very similar to walnut shells and indeed the artist’s interpretation of such a boat makes me think of the little boats we use to make as children out of walnut shells and matchsticks and then try to sail/float them in puddles. The sculpture consists of three large tilted metal vessels either side of the N5 at Scramogue, Co. Roscommon.